I was lucky enough to nab an early copy of I am out with Lanterns a few weeks ago when Emily Gale was in town to speak about the book at a YA Circle event at Dymocks Adelaide. I loved I am out with Lanterns for its strong themes and loved it even more for its complex and nuanced characters and the way their paths crisscrossed. Reading Lanterns felt like hanging out with friends and it’s been another of my fave recent #LoveOzYA reads. So I was keen to learn more from Emily about what went into writing the story. Emily, thank you so much for taking the time to answer my questions! Where did the idea for I am out with Lanterns come from? Very soon after I’d finished writing The Other Side of Summer I felt a strong urge to continue the story of two secondary characters from that book: Summer’s bristly older sister Wren and their big-hearted next-door neighbour Milo. Wren and Milo are both keen artists in The Other Side of Summer. I’d been thinking a lot about the history of male artists and their female muses, and when news stories broke (in 2016) about Instagram accounts run by high-school boys consisting of stolen images of girls, these two things struck me as being compatible in theme. As I Am Out With Lanterns begins, Wren and Milo are starting Year Ten, which meant I was writing something distinctly YA in contrast to The Other Side of Summer which straddles the end of primary school and beginning of high school. I’d always wanted to write a companion novel rather than a sequel or series, and here was the opportunity. The title of the book is taken from an Emily Dickinson quote, which you include as an epigraph: ‘I am out with lanterns, looking for myself.’ How does this quote resonate in the story? One of my characters, Juliet, has a lonely time at high school but is sustained by a very loving and nurturing home life, a years-long crush on someone at school, a good sense of humour, and a passion for literature, particularly the distinctive poetry of Emily Dickinson. Emily Dickinson wrote that line to one of her friends on the occasion of moving house, which she found fairly stressful being a real homebody. Sometime while I was writing draft three it occurred to me that I am out with lanterns, looking for myself is a really good summation of what everyone is doing during their teenage years, when you have that much more agency but you’re still discovering who you are. The story also begins with a quote from Oscar Wilde’s novel about a cursed portrait, The Picture of Dorian Gray. Can you share a bit about the portraits that appear in I am out with Lanterns? Once I’d finished reading The Picture of Dorian Gray as a teenager, I flipped back to the beginning and read it all over again, which was very unlike me but was part of my feverish Oscar Wilde phase (I also had a Daphne du Maurier phase and a Sweet Valley High phase…there were a lot of phases…). A large part of the story in I Am Out With Lanterns is carried by Wren who is stuck drawing portrait after portrait of her brother, Floyd, who died a few years earlier. It’s part of her grieving but she’s not moving past it, and she decides early in the story to do something about that. So she makes herself draw a completely random face from her imagination – and then that ‘face’ literally walks into her life. I wanted to draw on gothic literature but really ground it in a contemporary story, so Wren’s portrait – an inanimate object ostensibly – has a very real effect on her feelings and behaviour. What Wren doesn’t know is that she’s the subject of someone else’s portrait – someone who genuinely loves her. Then there’s Adie, who’s been her artist father’s muse since she can remember, unaware what a toxic relationship that’s become. Adie as a character may come across as more of an enigma compared to the others and that’s because she exists only as the subject of someone’s art. The narrative is shared between six characters who all have very different ways of seeing themselves and each other. Why did you choose to split the story this way and how does it tie into the key themes of perspective and perception? I knew I was writing about these very fundamental questions of how we see ourselves, how we interpret other people’s behaviour, what happens in the gap between our understanding of the way we come across and the way we feel about ourselves. So although I started out with Milo and Wren, followed by Juliet, the characters who became part of their story seemed to add so much more to the themes by having their own voice, which meant that I was able to directly examine the nature of interpretation and perception. To give an very cheesy example, there’s a chase scene in the 1997 romantic comedy My Best Friend’s Wedding: Michael (Dermot Mulroney) is chasing his distraught bride-to-be Kimmy (Cameron Diaz), and Julianne (Julia Roberts) is in a bread van chasing Michael, on whose lips she recently planted a surprise pash. Meanwhile Julia’s on the phone to her editor, George (Rupert Everett), who delivers this classic line… “Michael’s chasing Kimmy, you’re chasing Michael…who’s chasing you?” I guess that’s what I wanted to get across – we live in the big picture but we’re often trapped by our narrow perception, our own tunnel vision. From a technical point of view, balancing six voices is (I imagine) quite the task! Can you share a bit about how you managed the different threads as you were writing? First the good news: I used Scrivener to write this novel and there’s no way I’d have been able to pull it off otherwise. It allowed me to swap in and out of voices and move sections around with ease compared to a Word document. I found the process of switching between voices, once I’d established them, really invigorating. Now the bad news: I found myself in a mess, frequently. It took me four tries to get a first draft, which in real terms meant 4 x 90k words until I had a full draft I could work with. I wrote and wrote and wrote and went back to the drawing board so many times. I wouldn’t say I exactly ‘managed’ the different threads; it was more like a fight. Chaos, to be honest. However, once the overall story was plotted (draft three), I started a new draft in which I honed each voice by editing one character at a time. And I asked myself those basic questions – why does this chapter need to be here? What is this character adding to the story? How is the voice unique to this character? Wren, Milo, Adie, Juliet and Hari are endearing and complex characters who are learning to navigate their faults and vulnerabilities and own their strengths. Could you give a little introduction to each of them? Wren is cynical and sarcastic. She doesn’t like to be vulnerable but her brother’s death and the family’s move to the other side of the world has revealed a softer side, which is only for those close to her. Milo loves Wren, they’ve been best friends for a while. He’s autistic and has had a hard time at school. He’s compassionate with a great sense of humour, hates being judged and is just getting to know his own strengths. Juliet is a sweet, very funny loner who has a supersized memory for scenes from her own life and things she’s heard and witnessed – as she says “I would make a brilliant Facebook memory notification generator…if I had any friends.” Hari is confident and mature, in some ways able to navigate the different groups at high school without compromising herself, but also masking some personal pain regarding her identity. Adie has no idea who she is. Her narrative has been completely owned by her father, until now, and her journey is about recognising that. Your sixth narrator, Ben, is something of an outlier. Compared to the others, he seems very sure of himself and his place in the world. And he asserts his privilege and power in careless yet devastating ways. Why did you feel it important to give him a voice in the story? And why him instead of his friend Nate who is the real instigator behind the bad behaviour that occurs? Once I’d created his character and decided what his role in the story was going to be, I didn’t want him to get away with slinking around in the other characters’ chapters. I wanted to confront him – kind of ‘this is you, Ben, up close’. Often the villains in a story are kept at arm’s length – in this case, I wanted to analyse how careless he is, how unaware of his cruelty towards the people he deems unimportant. Ben dehumanises people in order to let himself get away with things. He lacks empathy and self-awareness. It’s not because he was born bad – it’s influence and status quo and mirroring his father’s behaviour, but he’s sixteen now so to me it’s a choice he makes every day. He could choose to be different; his situation has room for that. That’s why I didn’t want him to be the worst character in the book. Much of the male behaviour that’s under the microscope at the moment has carried on because it’s been deemed ‘normal’, ‘boys will be boys’ stuff, so I wanted Ben to be part of a pretty normalised equation – nice house, nice school, etc. Was there any part of the story that you found particularly challenging to write? I questioned myself the most over Milo’s voice and role and did a lot of research into autism early on, starting with a comprehensive history, Neurotribes by Steve Silberman, and then focussing on non-fiction/documentary by autistic authors and filmmakers, which continued for the two years that I worked on this book. I also had some very important help along the way from Jess Flint, who did a sensitivity reading for me as well as sharing resources and advice. My other sensitivity reader was Steph Cuthbert, who gave me great advice about sexuality representation. With multiple narrators and the theme of perception I knew I wanted to present a diverse cast in this story, and naturally my greatest fear was getting that wrong and causing harm. What part of the writing process do you most enjoy? I don’t think there’s a neat part that I enjoy so much as pockets of elation at each stage of the process. With this book, my biggest high occurred in Collingwood Library during a solid six-hour session (I didn’t even get up to pee) in which I rewrote the final third of the book and promptly burst into tears because finally, finally, I felt like I’d nailed it. What other books would you recommend for readers who enjoy I am out with Lanterns? If you enjoy books with several narrators, some of my favourites are The Guy, The Girl, The Artist and His Ex by Gabrielle Williams, Finding Cassie Crazy by Jaclyn Moriarty, The Centre of My Everything by Allayne Webster, and Take Three Girls by Cath Crowley, Simmone Howell and Fiona Wood (which explores some similar themes to Lanterns). In adult fiction, one book that kept me going whenever I started to doubt my multiple-narrator story is the brilliant This Must Be The Place by Maggie O’Farrell. Emily Gale has been involved in the children’s book industry for twenty years: the first decade in London as an editor and freelance writer, and the latter in Melbourne as a reader and literary agent and a children’s book buyer. She spent several happy years at Melbourne’s award-winning bookstore Readings, during which time she was instrumental in establishing their Children’s Book Prize. Emily’s writing includes Eliza Bloom’s Diary (2014), a duology for younger readers which has been published in several languages, as well as four novels for teenagers: Girl, Aloud (2009), Steal My Sunshine (2013) and The Other Side of Summer (2016) and its companion novel, I Am Out with Lanterns (2018). In 2017 The Other Side of Summer was shortlisted for the Victorian Premier’s Literary Awards (Writing for Young Adults) and the Aurealis Awards (Best Young Adult Novel). Emily, thank you again for being so generous with your time and responses. If I am out with Lanterns sounds like your kind of book, take a moment to add it on Goodreads and pick up a copy at your local bookstore or library. For the sake of transparency: Emily and I are both published by Penguin Random House Australia, but I bought a copy of I am out with Lanterns because it sounded amazing and organised this Q&A because I absolutely loved the book and wanted to know more! Are you interested in writing YA? 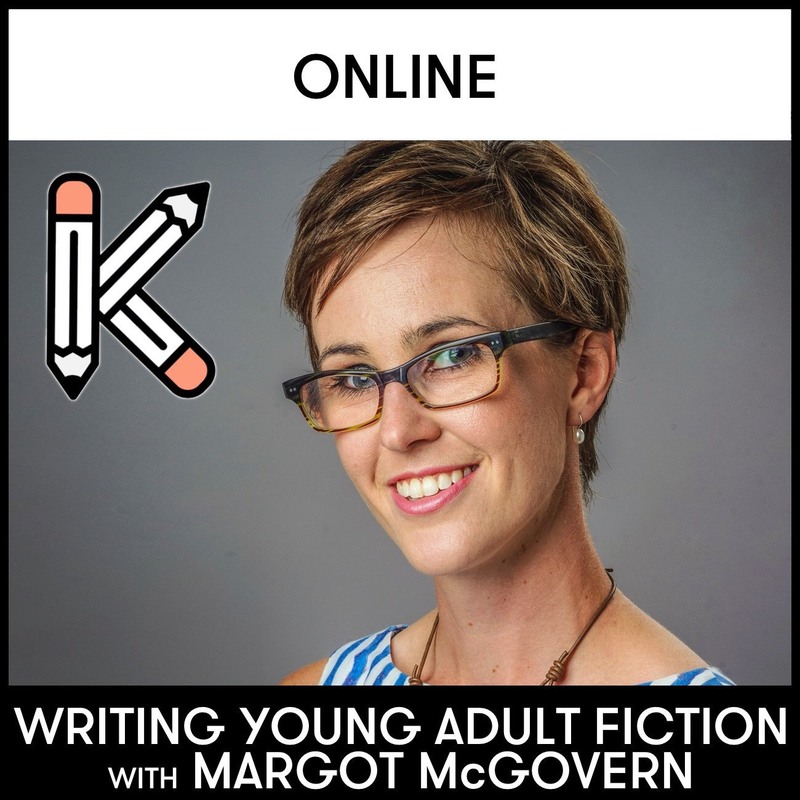 I’ve teamed up with Kill Your Darlings to produce ‘Introduction to Writing Young Adult Fiction’, an online writing workshop designed to equip aspiring YA writers with the skills and support to hone their craft and get to work. Like what you see? Get the latest from Lectito delivered to your inbox. Posted in Author Interviews, For Readers, For Writers, YA and tagged Australian YA, author interview, books set in Australia, Emily Gale, I am out with Lanterns, LoveOzYA, YA fiction, YA literature, Young Adult. Bookmark the permalink. Love this! I’ve been wanting to read this since I heard Emily talk at Perth Penguin Teen… it sounds so good and she speaks so well. Thanks for putting this together. Glad you liked it! The book is fab. This is a fantastic interview! I’m on the waiting list for this book at my library, can’t wait to get my hands on a copy. Books with multiple narrators always take a while for me to get into, but it’s interesting reading Emily’s explanation for her characters. Thank you! It’s a wonderful book. I’m usually not a huge fan of multiple narrators, but they work really well in this story. I hope you enjoy it when it comes in!